Depending on how you shade it, BB can look like stacks of books, or a bunch of washers. This one is a lot of fun! To make it even more 3-D, use a very simple background pattern, like Keeko, and use shading to tone it down even further. Can you show a picture of the keeko tangle, or describe it in some way? 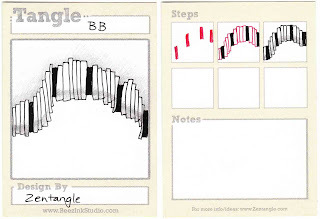 I notice several of your tangles (such as this one) give credit to Zentangle. Where do you find these? I have the kit with booklet and DVD and all their newsletters, but this one (and a few others) aren't anywhere that I've seen. I'm wondering if there are others I don't know about. And thanks so much for doing this - I've printed out all of yours for reference. It's very helpful. If I come up with any new, original patterns, I'll let you know! and it's the tangle in the upper right corner (all the straight lines). It looks like it ought to be easy to figure out, but I haven't figured it out yet. THANKS!!!!! I don't know how to do that pattern - it's not one of the official, original batch. So, I asked Rick at Zentangle. He said "I was inspired for this from watching mud dry and crack (and you thought watching paint dry was fun!). it has a very simple formula (once you know it)." Rick says that he will put the instructions into the October Newsletter. So, you'll have to wait a bit to find out... but you will have very good directions! Thanks so much!! I really appreciate your asking Rick. I'll try to be patient.